There seems to be an activity tracker for every kind of need and every kind of user. If running is your exercise of choice, we’ve put together our top picks for the best activity trackers for you and your fellow joggers. Take a look at our analysis below (in order from least to most expensive) before you purchase your new running partner — of the virtual variety, that is. NerdWallet takes you shopping: First up is the Fitbit Flex, a wireless activity and sleep tracker. Wears can utilize the wristband — which is priced at just under $100 — to keep track of steps, distance, calories burned and active minutes during their workout. Then, during rest time, use it to monitor sleep quality and wake up with a silent alarm. The fitness tracker provides five days of battery life before recharging, and its water-resistance makes it sweat proof for those intense workouts. Additionally, runners looking to improve their times will appreciate the device’s wireless syncing of stats to compatible computers and smartphones. Is a different Fitbit model right for you? See which tracker came out on top in a head-to-head matchup between the Fitbit Charge and Fitbit Surge. NerdWallet takes you shopping: Next up is the Misfit Shine. With a price point close to $100, this activity tracker is capable of measuring calories burned, distance traveled, steps taken, sleep quality and sleep duration. Runners will appreciate the fact that this device doesn’t have to be recharged after use. In fact, its replaceable coin cell battery can last for up to 6 months. Also ideal for running, the product can be worn practically anywhere — on your wrist, shoes, waist, pocket or collar — so you’ll never have to worry about a bulky tracker slowing you down. And finally, if you ever want to get some cross-training in as well, the Shine can track sports such as cycling, soccer, tennis, basketball and swimming too. NerdWallet takes you shopping: Finally, with our last pick, we’re bringing you a cross between an activity tracker and a watch. At $249.95, the Polar M400 is the most expensive product on our list, but it’s also the most advanced. This Polar device can measure just about anything a runner could want, from heart rate and 24/7 activity monitoring to sleep quality analysis. Additionally, the integrated GPS makes it possible to calculate pace, distance and altitude. 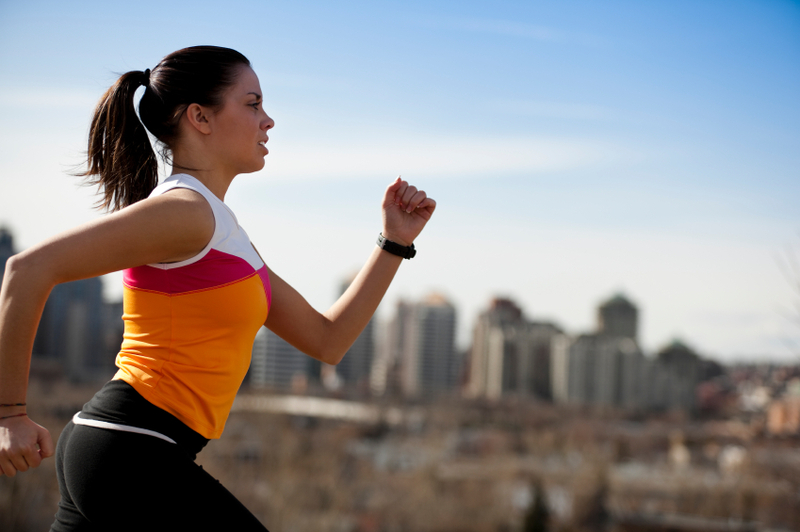 When it comes time to analyze your running, you can do that too. Utilize the Polar Flow Web service and mobile app for detailed workout breakdowns. Plus, set activity goals for yourself and even receive inactivity alerts via your watch when you’ve been idle for too long. If this product is a little out of your price range, keep in mind that Polar also sells an M400 model without a heart rate sensor for $199.95. In need of additional activity tracker shopping tips? Head over to our Activity Tracker Buying Guide for a list of features to consider before you make a purchase. Then follow our tips for getting the best deal on your new tech assistant.